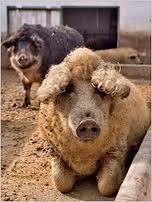 We are proud to present the Mangalica Pig from Eastern Europe. Our goal is to introduce this beautiful and highly exclusive product to the best Restaurants in Europe. We are working with the main supplier of Fresh Mangalica meat cuts directly from Hungary in order to obtain the Original and very best Mangalica products available.